Rai Haulage is a subcontractor to Aggregate Industries, based in Purfleet, Essex. Rai Haulage primarily transports asphalt and aggregate throughout London and surrounding counties. Thanminder Rai, Transport Manager explains how Rai Haulage has used FORS to make many improvements, specifically in fuel consumption and cycle safety. ‘On preparing for the initial FORS assessment, it was apparent that we already had a system in place, however FORS helped us put our policies and procedures into a comprehensive manual. We passed our bronze assessment with flying colours and received excellent positive feedback, which motivated us to continue progressing’, comments Thanminder. ‘With the support of Aggregate Industries it has helped us achieve gold’, explains Thanminder Rai, Transport Manager. ‘Once we were bronze accredited we really made use of the performance management tool kit, and the telephone support available from the FORS team was extremely helpful in achieving silver’, notes Thanminder. 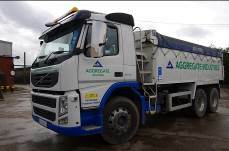 Aggregate Industries have shown recognition of Rai Haulage bronze accreditation and have in response provided Rai Haulage work on sites such as Olympics and Crossrail, which require the close proximity safety equipment. Aggregate Industries have also provided a financial contribution towards the cost of the close proximity safety equipment; this was a promotional and limited offer encouraging franchise hauliers to be the first on the FORS scheme. 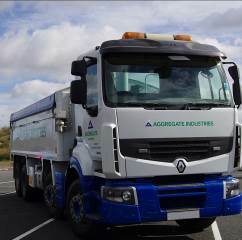 Aggregate Industries have made it a standard specification for this equipment to be fitted to all new vehicles from 2013. ‘FORS has helped us achieve a 11% improvement in our Miles per Gallon’, explains Thanminder Rai, Transport Manager. ‘One of the biggest changes we’ve made as a result of FORS, and a key contributor to achieving gold status, has been the fitment of cycle safety side sensors and side guards. We are now more aware than ever of the risk of fatal accidents and these features are aiding in reducing that risk’, reports Thanminder. ‘Investing time training our drivers is also an ongoing commitment for us. One way we ensure our drivers are up to date is through automatic email updates. We also have a system in place that notifies drivers of any previous cycle incidents on the route that they are travelling, on any particular day. This system encourages drivers to be extra vigilant on certain routes’, explains Thanminder. ‘Since October 2013 we’ve achieved a 11% improvement in our Miles per Gallon (MPG). We can attribute these savings predominately to the purchase of a new vehicle, use of a telematics system and driver training’, insists Thanminder. ‘Moving forward, we aim to reduce engine idling from 5 minutes to 3 minutes between October 2018 and September 2019 with the use of a telematics system, thus giving us better fuel consumption’, explains Thanminder. ‘FORS has encouraged and supported our progression through the FORS levels, and we are proud to be one of the first small companies to be awarded FORS gold status. However, our journey does not end here, as it’s all about continual improvement and ensuring we remain proactive in implementing best practice and developing our drivers’, continues Thanminder. ‘The FORS scheme is of great value to any freight business operating in London or anywhere else come to that. FORS gold status is achievable for any business, big or small. We encourage all small businesses to achieve FORS gold’, concludes Thanminder.